2019 ATA Annual Convention & Meeting – Sandestin, Fla.
Join your colleagues and friends for the Alabama Trucking Association’s 2019 Annual Convention & Meeting, set for April 25-27 at The Hilton Sandestin Beach Golf Resort & Spa in beautiful Destin, Fla.
To register, call 334-834-3983 to register with an ATA staff member, register securely online, or download a registration packet below. Carefully review and complete all forms and fax or email them to Jane Nixon at 334-262-6504 or jnixon@alabamatrucking.org. Heads Up! Our Convention room block at the Hilton is completely full, but worry not, you can still make lodging arrangements with the hotel for the adjacent facility, the Luau. Book online here and enter the group code 24499, or call 800-320-8115 and mention your affiliation with the Alabama Trucking Association for the best rates. Cancellation Policy: Once an individual reservation has been made, any changes should be made directly with the Group Reservations Department. The Hilton Sandestin Beach Golf Resort & Spa requires a one night’s room deposit and must accompany reservation form (check or major credit card). A credit card will be charged for one night’s deposit. To ensure accommodation availability, reservations and deposits must reach the Hotel at least 30 days prior to arrival. Full refund of deposit will be forfeited unless cancellation is received 14 days prior to arrival. Early Departure Fee: An early checkout fee of one night’s room and tax will be charged unless the Hotel is advised prior to or at the time of check in. Details are now finalized for ATA’s 2019 Annual Meeting And Convention — and from the looks of things things, this could be our best meeting ever! The event is packed with informative programs, exciting events, and top-notch entertainment offerings. On top of that, attendees have an opportunity to network with the best business leaders our industry has to offer. Our agenda focuses on the challenges and opportunities that lie ahead for trucking. Together, we will find solutions that will benefit each of us, no matter what niche or business sector we serve. Each sponsorship level offers exclusive benefits and special recognition before, during and after Convention. 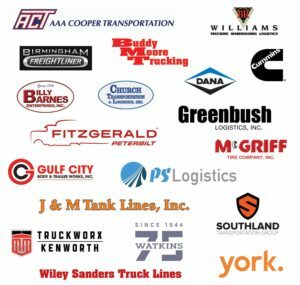 Every sponsor is listed on the ATA Convention website; the onsite printed program; and in wrap-up coverage in 2nd Quarter edition (June 2019) of Alabama Trucker magazine. Depending on the level of your sponsorship, your firm’s logo will appear on the aforementioned items and at select locations and events during Convention. Sponsorship fees must be paid in full by March 17, 2019. A single sponsorship cannot be split between two (or more) companies. Davison Fuels & Oil Co.
R. E. Garrison Trucking, Inc.
People’s United Equipment Finance Corp.
Fuller Warehouse & Gin, Inc.